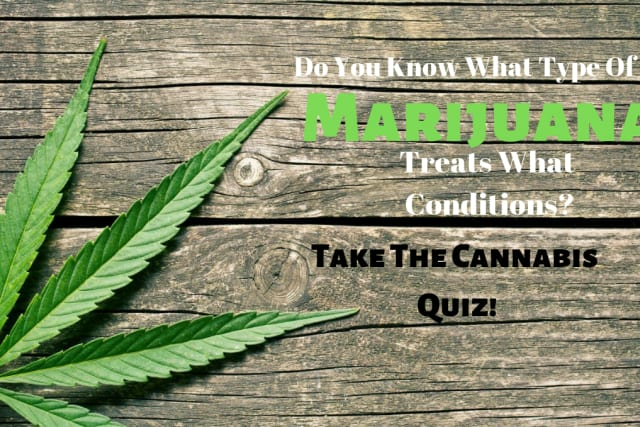 Do You Know What Type Of Marijuana Treats What Conditions? Take The Cannabis Quiz! While medical cannabis effects everyone differently, researchers have come to some general guidelines. Find out if you are a marijuana expert by taking the Cannabis Quiz! Insomnia patients are often advised to try these particular types of medical cannabis strains. People with epilepsy will often be treated using this type of medical cannabis. Inflammatory bowel disease is often treated with this type of medical cannabis. While not offering a cure for cancer, these types of cannabis strains have been shown to offer relief to the symptoms felt by cancer patients. Multiple Sclerosis patients are often treated with this type of medical cannabis. Arthritis sufferers often find relief by using this type of medical cannabis. Mental health patients have reported experiencing a relief of symptoms with this type of medical cannabis. HIV/AIDs patients are often prescribed this type of medical cannabis. You aced the Cannabis Quiz! Congrats! You clearly know your stuff about medical cannabis and its uses. Sorry but perhaps you don't know as much as you thought about medical cannabis.